100 Things to Do Before You Grow Up by Lisa Gerry. Review: You only have 6,570 days before you grow up. That's it. So make the most of those days before they're gone! But what to do? 100 Days Before You Grow Up by Lisa Gerry is the solution. It gives you fun things to do any day! Some you need to plan, some you can do in your backyard. Some things are crazy, some are just plain fun. 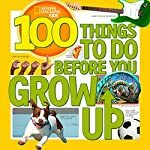 Any way you put it, 100 Things To Do Before You Grow Up is the perfect book for you! I really enjoyed this book. It is for a 3rd grade reading level, boys or girls. But the awesome activities in this book are for anyone. Adults can even have fun with this book! You can do things with your child that you loved to do as a kid, or something you've always dreamed of doing. It is an amazing book for anyone to read, and even I will try some of the activities! We would like to thank National Geographic for providing a copy of 100 Things to Do Before You Grow Up for this review. Have you read 100 Things to Do Before You Grow Up? How would you rate it?